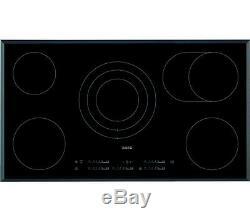 AEG HK955070FB Electric Ceramic Hob - Black. Kitchen Appliances > Built-in Appliances > Built-in Electric hobs. Brand new & pristine product. Top features: - OptiHeat Control allows you to make efficient use of residual heat - Direct Touch controls keep you in complete control - Extra-wide hob offers a variety of cooking options OptiHeat Control allows you to make efficient use of residual heat The HK955070FB features OptiHeat Control which monitor each heat zone as it cools, allowing you to use residual heat to achieve low energy cooking results. You can quickly and easily see whether the heat zone is still hot enough to cook on or can be used to keep food warm. It also keeps you safe by warning you if the surface is still hot. You can rapidly heat the hob using the Automax function, which automatically uses the highest heat setting before resetting the hob at the heat setting of your choice. An Oko Timer works out exactly when to switch off the hob to finish cooking the dish using residual heat, saving energy and helping you to reduce your household bills. Direct Touch controls keep you in complete control You can quickly and easily control the heat while using the HK955070FB through its Direct Touch controls. These sensitive touch controls allow you to slide the heat up or down, allowing for a higher degree of accuracy while cooking. A CountUp timer starts at zero and counts upwards, meaning that you can track exactly how long each stage of the cooking process is taking. Extra-wide hob offers a variety of cooking options The HK955070FB offers you plenty of cooking options thanks to its extra-wide design. With two different circular zones, an oval multi-purpose zone and a large central paella zone, you have flexibility when it comes to creating meals. _________________________________________ ELECTRICAL INSTALLATION: This product requires professional installation to a dedicated cooker circuit (identified by a big red cooker switch) by a qualified installer, such as one of our Team Knowhow experts. All Currys/PC World Outlet guarantees are non-transferable. Type: Built-in electric ceramic hob. Hob power: Front right: 1.8 kW, Front left: 1.8 kW, Back right: 2.2 kW, Back middle: 2.7 kW, Back left: 1.2 kW. Safety features: Residual heat indicators, Child lock, Automatic switch-off. Other features: Acoustic signal with switch off option, Count up timer, Eco timer, Sound off function, OptiHeat control. Installation: Please note this product should be installed by a qualified engineer, such as one of our Knowhow experts. Minimum distance required / Minimum clearance above hob: 500 mm. Box contents: AEG HK955070FB Electric Ceramic Hob, Instruction manual. Dimensions: 50 x 910 x 520 mm (H x W x D). Boxed dimensions: 118 x 998 x 600 mm (H x W x D). Boxed weight: 12.92 kg. This product has no reviews yet, however see what our buyers say about our other products..
Can a Currys or PC World retail store help? Reassuring 12 month guarantee on all products. The item "AEG HK955070FB Electric Ceramic Hob Black" is in sale since Wednesday, June 28, 2017. This item is in the category "Home, Furniture & DIY\Appliances\Cookers, Ovens & Hobs\Hobs".